For the most part, Christmas in the UK is a secular affair all about spending time with family and friends – and money on things things we don’t want, apparently. And yet, despite the trend for spending less, 12% of people surveyed said their “excessive Christmas spending will give them a financial hangover for 2016“. But hey, it’s Christmas. Surely it’s worth it? So we splurge a little, but we’re grateful, right? Well, according to an archived Daily Mirror piece on debt and Christmas, in 2011, at least 1 in 10 of the gifts we received was not what we really wanted. In monetary terms then, we managed to spend around £594million on unwanted Christmas gifts. Well done us! But it’s not just on presents that we’re literally throwing our money away. A 2014 survey by The Money Advice Service found that the average adult spends £28 on food and drink that will end up in the bin. Add that to the value of the unwanted gifts, and that’s a whopping £2.4 billion we’re spending on filling our bins! Thanks to Hugh Fearnley-Whittingstall’s War on Waste, rather than making us feel like tight bah-humbugs, if we spend less and consume more mindfully, this Christmas offers us an opportunity to not only do the right thing for our planet (and probably our pockets too), but also feel good about it. So, in line with the principles of the 3Rs of sustainability and a bit of circular thinking, here are 11 ways towards a mindful MeRRRy Christmas. 1.) Use last year’s Christmas cards to make gift tags, decorations and more Christmas cards. If you didn’t keep last year’s cards, see next tip. 2.) Make a point of not throwing out this year’s Christmas cards once it’s all over. Keep them for next year. See tip #1. 3.) Have a go at making your own wrapping paper and packaging from old magazines and all manner of other ‘waste’ materials. 4.) Have a go at making your own truffles and sweet treats to avoid creating small mountains of brand name chocolate wrappers. 5.) Homemade pickles and preserves and flavoured spirits make wonderful small gifts which can easily be scaled up into thoughtful, tailored ‘hampers’ by adding fairtrade chocolate, teas, coffee and spices to suit the recipient. 6.) If you don’t have the time or inclination to make pickles and jellies yourself, find out where local producers are selling their wares and head there instead. 7.) Consider a #secondhandxmas – agree with friends and family that gifts must be secondhand and set an upper budget. If gifts are unwanted, they go back to the charity shop they came from. 8.) Instead of buying fancy, expensive candles, try crafting your own creations with old jam jars, inexpensive tea-lights and other bits and bobs you have around the house. 9.) Combine a family or friends walk with a forage for materials with which to make natural decorations. Think holly, broken off branches, ivy, pine cones, berries etc. Normal foraging rules apply: take only from places where it’s allowed, take only what you need and in the case of berries, leave plenty for the birds. 10.) Plan your holiday menu with leftovers in mind. If you buy too much in the way of perishables, consider ways of lengthening its life by preserving, freezing or baking. Failing that, and any friends or neighbours who could use it, make sure it goes in your composter or in your food waste bin. 11.) A lot of these suggestions require time. If that’s something you have very little of, how about turning social gatherings into ‘making’ parties to get stuff done and have fun too. 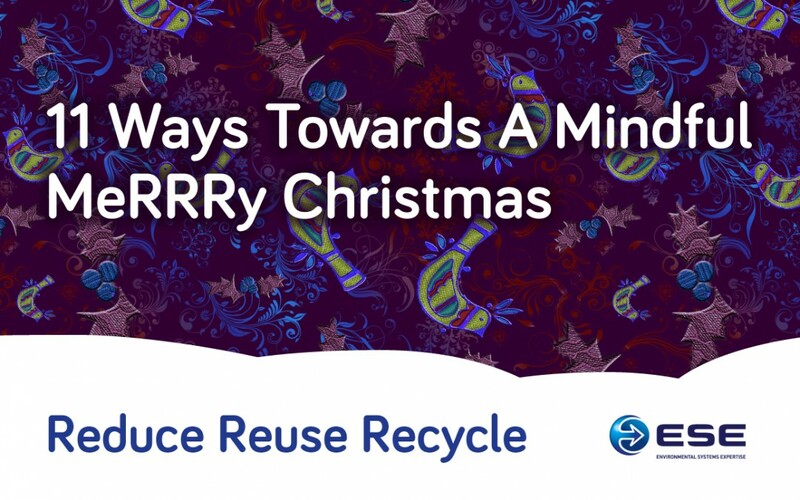 Here are a few links to inspire you to reduce, reuse, recycle this Christmas!